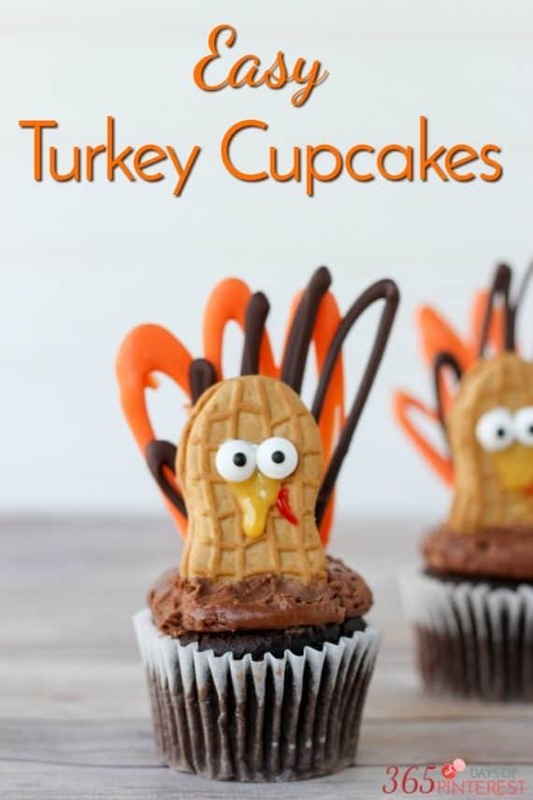 Have you started pinning Thanksgiving ideas on Pinterest yet? About half of my feed has shifted to Christmas, so I figured it was time to get started on Thanksgiving already! 🙂 It seems like once the calendar turns to October, the rest of the year just goes by in a blur. 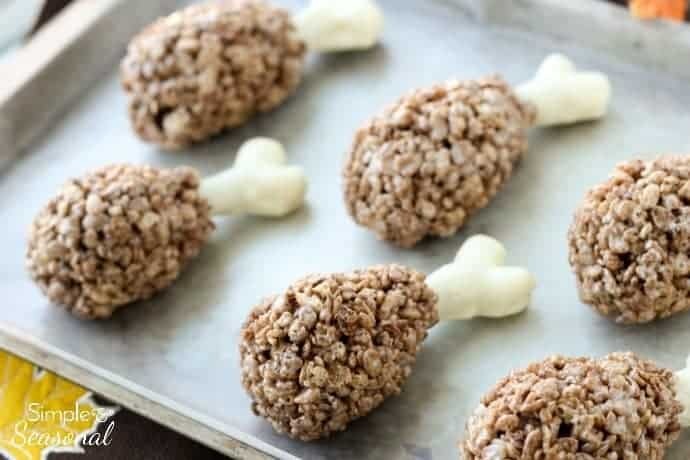 A few years ago I made Pumpkin Rice Krispie Treats so this year I figured I’d try Turkey Leg Treats! 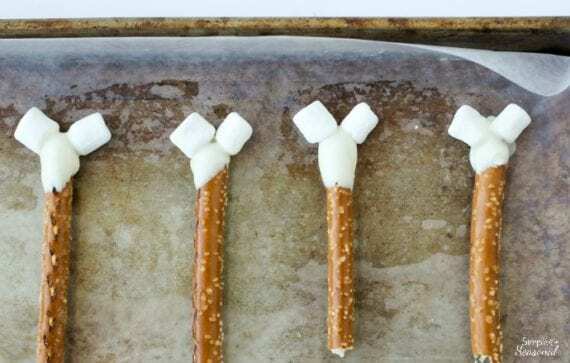 Dip the end of a pretzel rod (make sure you’re using rods, not sticks) into melted vanilla candy melts and then attach two mini marshmallows. Let set. 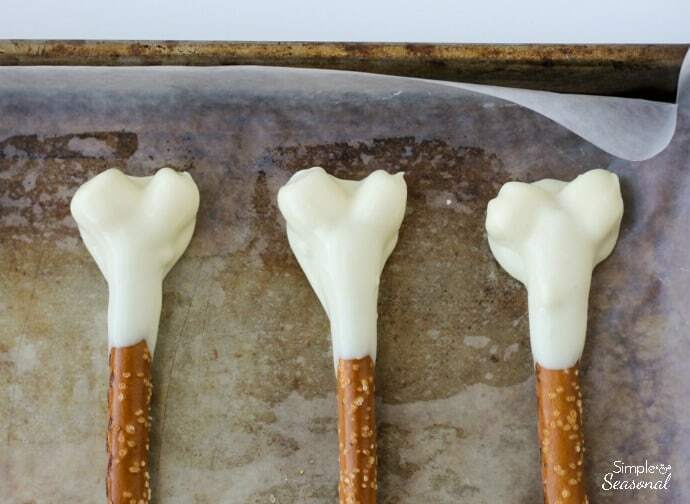 After the candy is set, then dip again to cover the top 1/3 of the pretzel rod. This is SO much easier if you’re using a disposable dipping tube like this one for long things like pretzel rods! 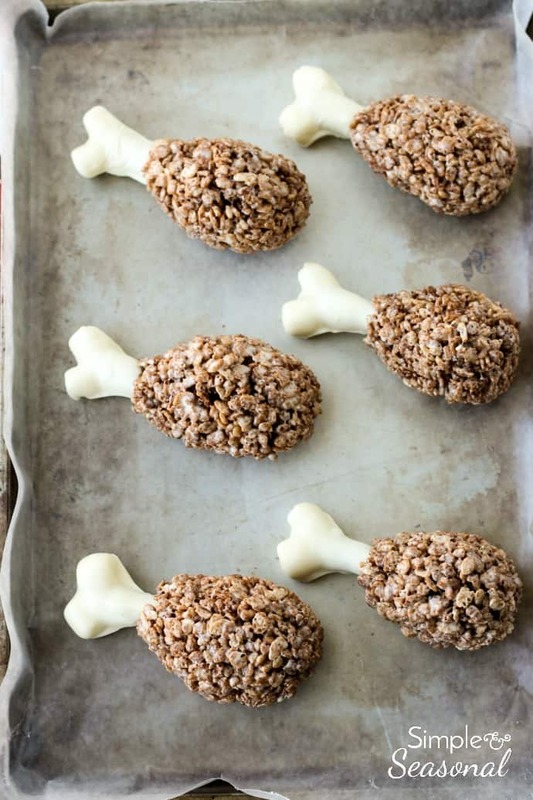 Form the cereal mixture around the pretzel rod and shape into “drumsticks.” Place on wax paper until cooled and hardened. Don’t refrigerate! 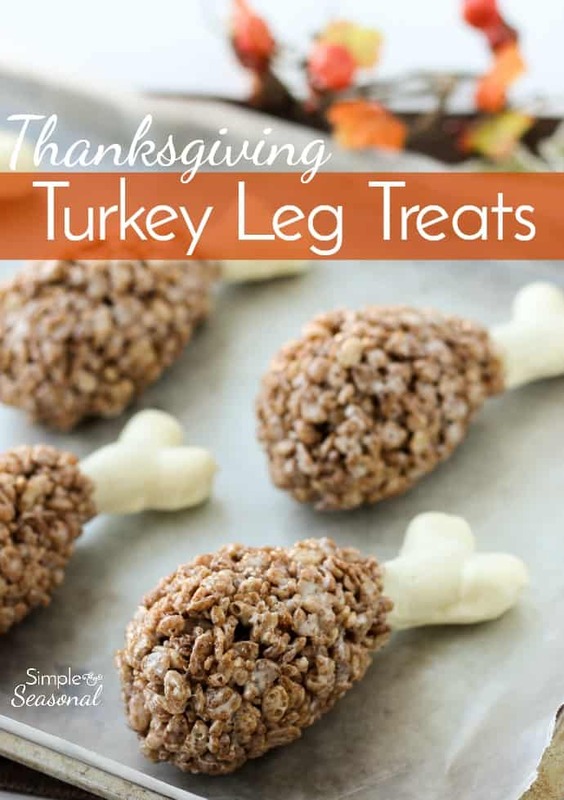 I can’t take credit for the idea for these Turkey Leg Treats. 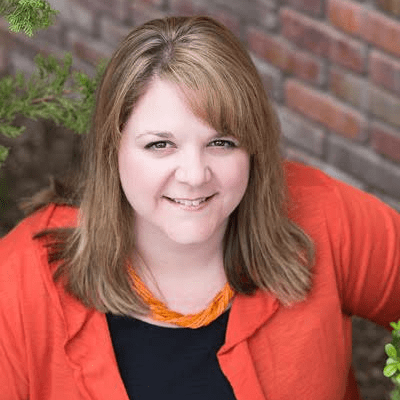 I follow Kitchen Fun with my Three Sons on Facebook and I saw the idea there. I decided to use chocolate cereal because it looks more like a turkey leg to me and has the bonus of tasting great as well! Dip the smooth end of the pretzel rod and then press two marshmallows onto the end. Repeat until 12 "bones" are dipped. Let sit for about 5 minutes. Dip the pretzels again, covering 2/3 of the rod. Let sit. In a saucepan, melt the butter and marshmallows, stirring until smooth. Remove from heat and stir in cereal. Mix until coated well. 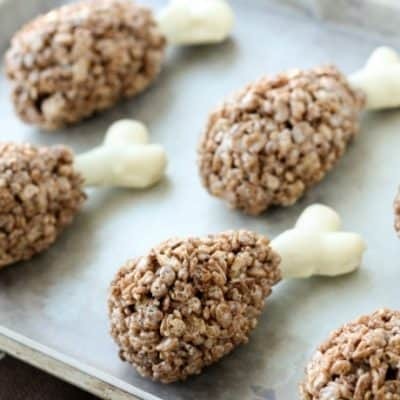 Allow to cool just a bit and then form the cereal mixture around each pretzel rod, forming a drumstick. Don't try this until cooled enough, or it won't hold its shape! Spray your hands with cooking spray to keep the marshmallow from sticking while you work. Place on a wax paper lined baking sheet and let sit until fully cooled. 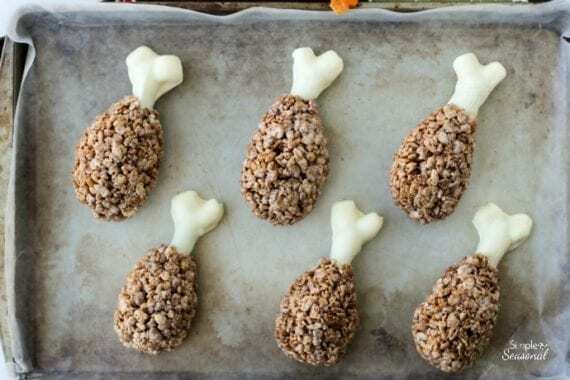 Try making Pumpkin Rice Krispie Treats or Turkey Cupcakes to go along with these adorable Turkey Leg Treats! 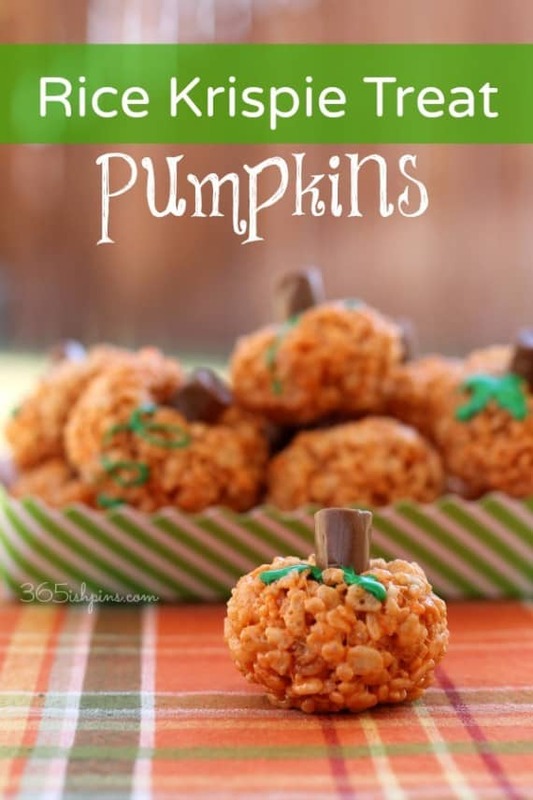 You could make them a day in advance, but don’t put them in the refrigerator or the pretzels will get soft and stale. Would you care to elaborate on that? Which measurements exactly? It’s a pretty standard marshmallow treat recipe. After double checking, I did notice that the bag size for the mini marshmallows is a bit small. It depends on the brand, but most of them are now 16 oz, and not 10 oz so I deleted that detail. Really, it’s very forgiving-you can work with more/less marshmallows/cereal/butter without affecting it much. I do use more cereal than typical because they hold their form better if they aren’t too “gooey” from marshmallow. Hope that helps!